After breakfast at our hotel, we took the bus to the Great Wall. Did you know that the entire Great Wall spans at least the distance from San Francisco to New York and back again? However, many of the older parts are no longer fully intact because they were built of dirt and clay. These sections have been destroyed or covered over by forests. There are 629 km of the Great Wall in Beijing, and five sections that are open to the public. 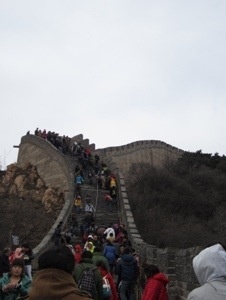 The section we visited was called the Badaling section. It was originally built in 1505 during the Qing dynasty (1368-1644), and after being restored, it was reopened to the public in 1988. The Great Wall was built during three separate dynasties. The first two sections were the ones built of dirt and clay that aren't necessarily still intact. There were 7000 km built during the Qin dynasty (221-206 BC) and another 10,000 km built during the Hang dynasty (202 BC-220 AD). The last section, constructed during the Qing dynasty, was built of brick and stone. While we were on the wall, we were quite the tourist attraction. Everyone kept asking to take photos with us, and many even took photos of us while we were posing for photos with our own cameras. We had lunch and then headed to the Science and Technology Museum. The children were excited to see and touch all of the exhibits. There were three floors, and we did our best to see and play with as many of the exhibits as possible. The exhibits were on many topics, such as energy, water, environment, technology, transportation, and more. Afterwards, we saw the Olympic Park. The main stadium is known as the Bird's Nest because of its shape. We also saw the Water Cube, the natatorium where the swimming and diving events took place. At dinner, we continued to be quite popular. The other diners were not shy about staring at our table, and at one point, they even came over and stood next to our tables watching us. They were interested in how different some of us looked, and they were surprised that our children spoke Chinese. They took pictures and so did we. It was a tiring day filled with new adventures!